Moderating a panel can be a snap...or a snooze. 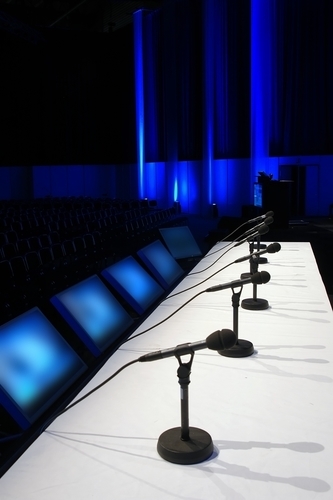 Most speakers know the basics of moderation--introducing speakers, describing the outlines of how long each one will present, taking and directing questions from the audience, and calling a halt to the discussion to keep thing on time. Get the speakers to interact with one another in surprising ways: Ask each panelist to ask a question of the panelist next to her, or to offer a piece of advice to the next panelist based on his experience in the area under discussion. Ask each speaker to share one thing she learned while listening to the other speakers. They're all double-whammy approaches that give you an expert's view of the expert. Audiences will love it, and you'll get unique content. Assign a thematic framework for each speaker: Don't wait for synergy to arise naturally. In this post from a science writers' conference, one audience member observed a panel of five science book authors, and noted "the elegant framing and naming of the talks that [moderator] Robert Lee Hotz had assigned to his speakers: voice (KC Cole), story (Jonathan Weiner), character (Charles Stipe), structure (Jennifer Oulette), and authority (Carl Zimmer). It was a nice way to uniquely draw out each speaker, while also reviewing some things we can’t overlearn. It was the opposite of stridently didactic." You can steal this idea and apply it in many ways: Have each panelist discuss a different aspect of a shared customer base or audience; a different trend in a wide-ranging field; one tool they can't live without. This approach works especially well when you can identify the over-arching theme, then assign each speaker one aspect of it. Weave a conversational thread through the speakers' topics: If you know enough about what your speakers plan to say and can see similarities -- for example, on a panel about career achievements, each of them mentions to you that she'll be recalling an important internship that led to great career moves later -- you can use that thread to introduce each speaker with a common theme. Just be sure you don't steal their best stories as you're doing it, and warn them upfront how you will be tying things together with your thread, so they can play off that theme. What else do you do to up your game as a panel moderator? Share your tactics in the comments.